Perfection – we strive for it, and envy those who come close to it. Well, at least a little. Take Martha Stewart. Can the woman do no wrong? She can paint Keds sneakers with intricate paint hues to make them rival glam Christian Louboutin heels. She can arrange flowers like nobody’s business. She can even do time behind bars with class. Moreover, she can bake. Boy, can she. Regular readers of Food Gal know that I simply cannot resist a great, chewy cookie. It’s one of the true pleasures in life. 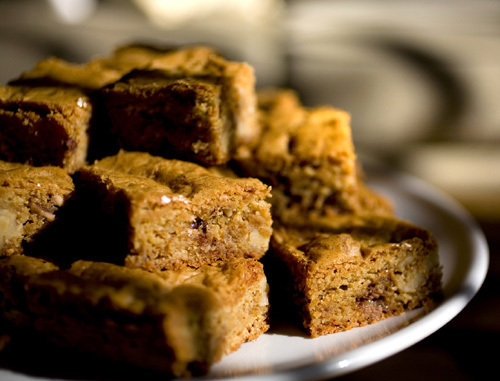 In Martha’s “Brown Butter Toffee Blondies,” I have found nirvana – chewiness of the perfect texture. How good are these cookies? Let’s just say that I made these not once, but twice in one month. I probably would have made them a third time had I not run out of butter. Speaking of butter, don’t let the added step of browning the butter scare you off. It does add a little more time to cookie-making, but it is so worth it for the superlative nutty, rich, intense flavor it adds. Just be sure to watch the butter closely on the stovetop, because once it starts to color, it happens fast. The last thing you want is burnt melted butter to ruin these fab blondies. Perfection in life may be impossible. But perfection in baking is only a Martha Stewart blondie recipe away. In a saucepan, over medium heat, cook butter until it turns golden brown; remove from heat, and let cool. Whisk together flour, baking powder, and salt. In the bowl of an electric mixer, combine browned butter and both sugars; stir with a wooden spoon until combined. Attach bowl to mixer; add eggs. Using paddle attachment, beat on medium-high speed until light and fluffy, about 3 minutes. Add vanilla, and beat to combine. Add flour mixture, walnuts, and toffee bits. Mix until thoroughly combined, and pour into prepared pan. Bake until a cake tester inserted in the center comes out clean, 35 to 40 minutes (do not overbake). Transfer to a wire rack to cool completely before turning out of pan onto a cutting board. Peel off parchment paper; cut blondies into shapes with 3- to 3 ½-inch cookie cutters. Blondies can be stored in an airtight container at room temperature for up to 3 days. I love brown butter and brown sugar! This sounds like a delicious cookie. I can imagine biting into it, feeling the cookie slowly yield to the pressure. Mmm. Good. Foodgal “ran out of butter”? I hope you try them. This has truly become one of my favorite go-to recipes for GREAT cookies.